Beautyberry (Callicarpa americana) of the Mint (Lamiaceae) family, formerly of the Vervain (Verbenaceae) family, is a large deciduous shrub that occurs throughout the Southeastern U.S. from Texas and Oklahoma to southern Missouri and southwestern Kentucky, to Maryland, thence south and east to the coasts. 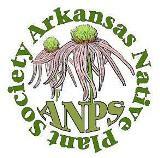 In Arkansas, it is recorded from across the state but is more sparse in the northernmost Ozark counties. The genus name comes from Greek meaning “beautiful fruit”. The specific epithet means “of the Americas”. It is also called American beautyberry, beautybush and French-mulberry. This plant, with multiple stems growing from the root stock, does well in a wide variety of soils in full sun or partial shade. Branches, growing from previous year’s stems and older branches, are irregularly spaced and unbranched in current year’s growth. Most branch growth occurs from side buds rather than terminal buds. New, rapidly growing basal stems may arise from among older stems of mature plants. In favorable sites, new stems and fruit-producing branches may grow up to three or more feet per year. Plants have a relatively dense habit in sunnier sites, while in shady sites plants have fewer stems with a more open habit. Rapid growth rate of new branches and weight of fruit along ends of branches cause branches to permanently arch downward to the extent that mature shrubs have a cascading appearance. Overall plant height may be 7 feet or more with greater widths. Plants may live for 15 or more years. New growth of stems and branches appear woolly due to being densely covered with short, branched hairs. Dense hairs extend onto petioles and peduncles, and along the veins of lower sides of leaf blades, along with shorter hairs throughout upper and lower surfaces of leaf blades. Hairs on stems wear away throughout the growing season, the stems becoming smooth and tan with variously-sized, thin, elongate lenticels (pores). On old growth, lenticels become rounded to irregularly shaped and corky. Photo 1: A first-year seedling exhibits characteristic widely spaced opposite leaves and rapid growth. 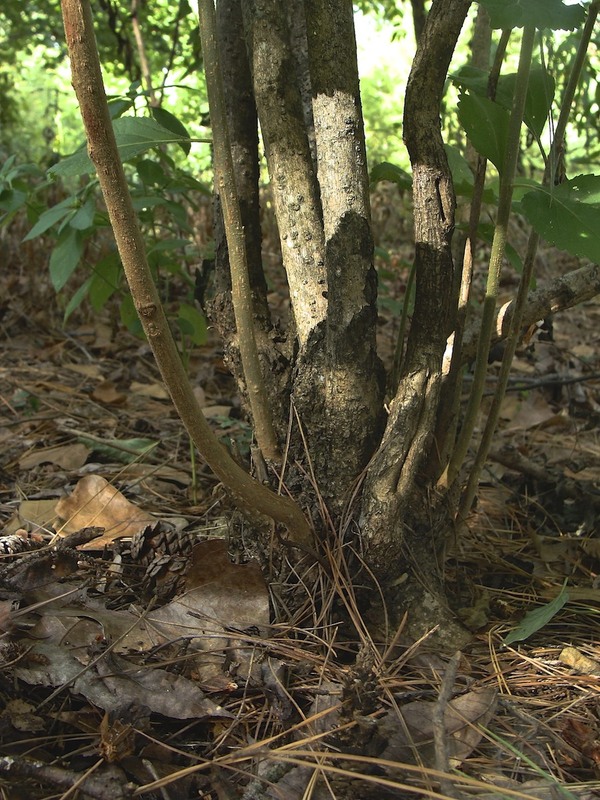 Photo 2: Trunk of a 12-year or older plant showing “old growth” stems alongside one- and two-year old stems. Note lenticels on old and young stems. Large, elliptic-obovate, mostly opposite leaves occur along new stems and current year’s branches. Leaves may reach 9 inches long (including the 1½ inch flat-topped petioles) and about half as wide. Leaves, which are generally widely spaced and opposite, tend to be closer together and significantly smaller toward the branch apex. However, at branch apices, leaves may occur singly or as a group of several leaves. 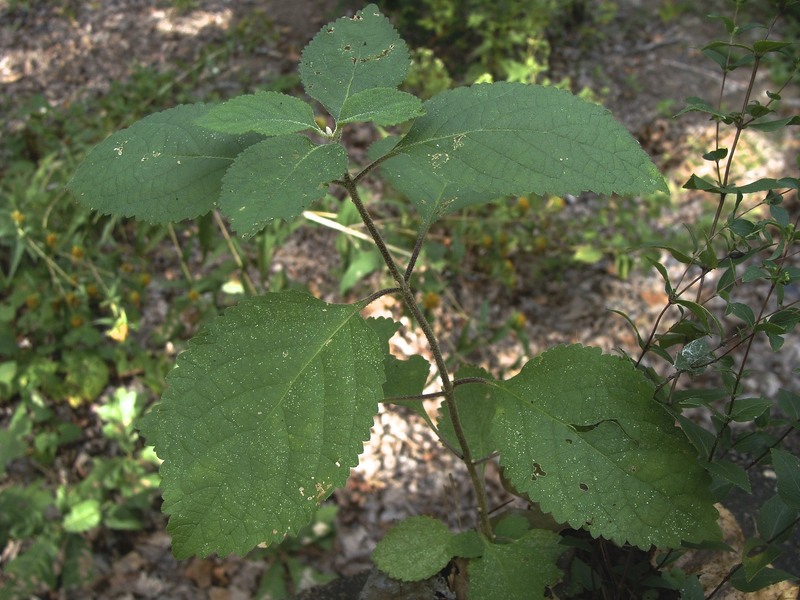 Leaves, with a consistent shape throughout the plant, are dark green above and light yellowish green below with yellow veins. Leaf blades are flat, soft and flexible with tips and bases that are similarly tapered. Margins, except at the tip and near the base, are dentate with triangular teeth. Venation is impressed above and raised below, with primary veins that are pinnate but offset across the midrib. Secondary veins connect primary veins to one another (cross-venulate). Leaf blade, on upper side, is up-flexed between veins. In fall, leaves exhibit a nice yellow-green coloration. On new branches, axils of leaves approaching branch apices develop two buds, one above the other. Lower buds may develop into branches the next growing year while upper buds may develop into inflorescences during the current year. In early summer, clusters of flowers grow from the upper axillary buds. Clusters above paired opposite leaves are of equal size (referred to herein as “double cluster”). Peduncles of clusters are thrice bifurcated so that eight small umbels grow from a single leaf axil with up to ten or more flowers per umbel. All flowers in a double cluster bloom and fade simultaneously. Double clusters bloom sequentially toward branch apices with only one double cluster reaching anthesis at one time. Flowers bear light pink or white, stubby and funnel shaped corollas, approximately one-eighth-inch in diameter, with four rounded lobes and prominently exserted stamens and styles. Filaments, with knobby divided yellow anthers, and styles, with a flattened split stigma, have a coloration similar to the corolla lobes. Flowers are set in a light green one-piece, cup-like calyx. Photo 3: In early July, branches and petioles are woolly. Note succession of buds to flowers to fruit. In late summer, flowers reliably produce fruit (berries) with luminous magenta or white skin. As they grow, the double clusters of fruit form a dense flattened to rounded mass up to about 1½ inches wide with a depth of about ¾ inch. Fruit masses, enveloping leaf bases, are aligned along slender branches in shish-kabob fashion. As leaf spacing decreases near branch tips, fruit clusters may join together to form a longer continuous cluster. Also, when “extra” leaves (typical opposite leaves plus one or two more) are present, each leaf produces its own flower/fruit cluster resulting in larger fruit clusters. Photo 4: Shrubs in full sun, as shown, have a more dense habit than those in partial sun. Photo 5: In this mid-September photo, note that the pinnate primary veins are offset across the midrib. Also, note dentate margins. A fully developed fruit has four cupped, somewhat elongate, thin light tan seeds. Seeds are small in relation to fruit size, with each seed set separately in light-colored mealy fluid, the cupped side with a fruit core of the same fluid. Fruit, unless eaten by wildlife, remains after leaves have fallen. 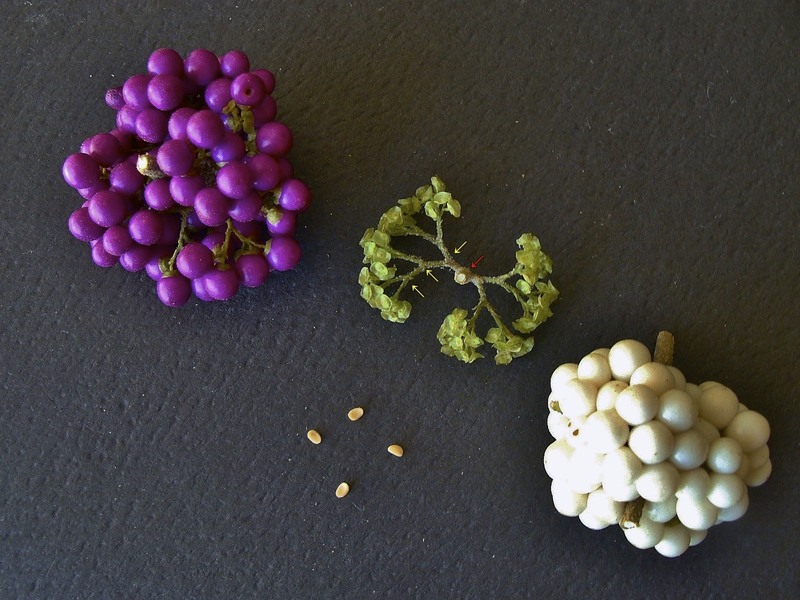 Photo 6: Double clusters of beautyberry fruit are shown (common magenta [left] and less common white [right]) with a double cluster (fruit removed [center]) in which thrice divided peduncles (see yellow arrows) and pedicels can be seen along with calyces. Stem is removed (see red arrow). Seeds are also shown. For a larger garden or natural area this plant provides good color and structure as well as an excellent wildlife food source. Its large open arching structure and large leaves attract attention even before fruit develops. When fruit ripens to a magenta color (the complimentary color of green) or pure white* and leaves assume their fall color, this plant is a “show stopper”. Fruit can persist into winter, but may be devoured by birds, small mammals and deer well before winter. Although drought tolerant, leaves tend to wilt when soil dries, but rebound with renewed moisture. Cold winters may kill stems, but not the plant. Beautyberry is a prolific seeder and can form colonies from seed. Photo 7: In mid-October, fall leaf color accents magenta fruit. 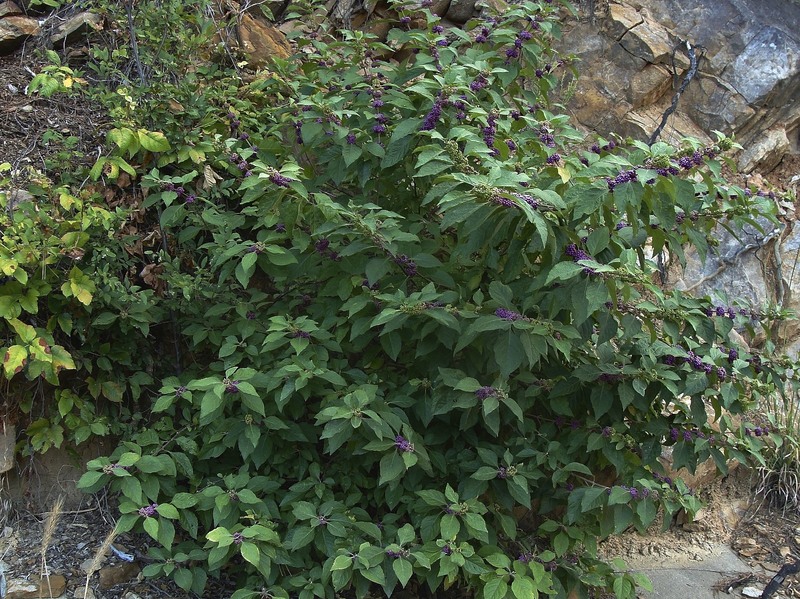 A second species in the same genus has been identified as escaped in Arkansas, namely, non-native Chinese beautyberry (Callicarpa dichotoma), which is documented from Saline County. 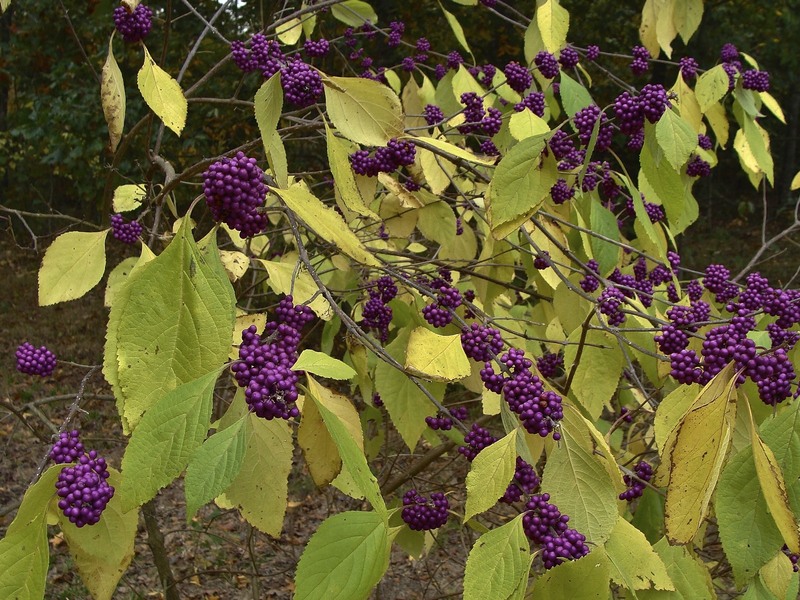 This winter-hardy plant also bears magenta fruit, but on a smaller shrub than American beautyberry. 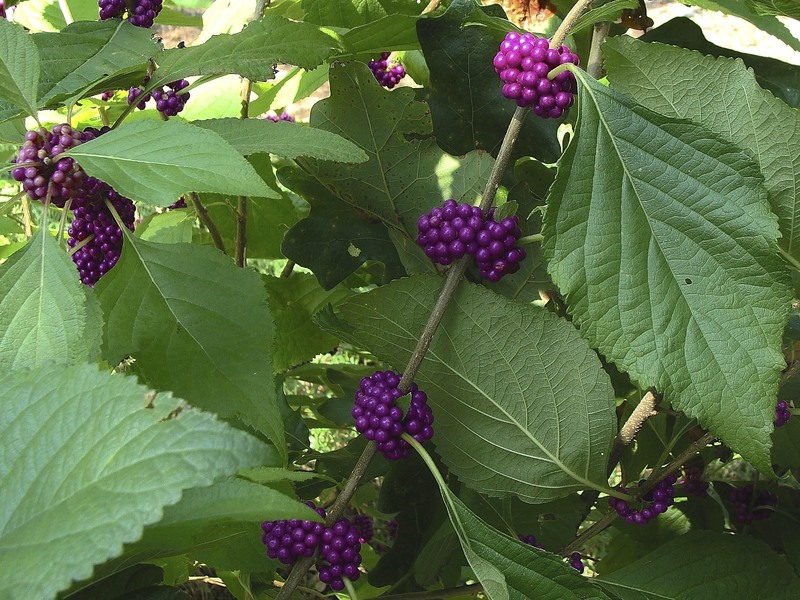 Chinese beautyberry, although not now classified as invasive, is potentially invasive. White fruited beautyberry is a form of Callicarpa americana. This white form has been referred to as Callicarpa americana var. lactea. The flowers are also white. Note: Raw fruit should not be eaten. However, fruit has been used for jelly as noted in Florida’s Incredible Edibles by Richard Deuerling and Peggy Lantz. This same book also provides a recipe for using beautyberry as insect repellant. 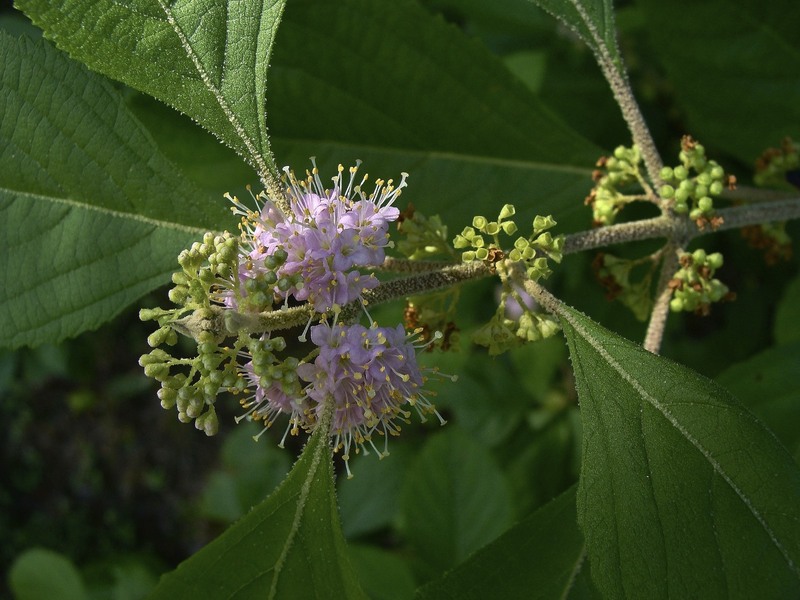 This entry was posted in Know Your Natives, Native Plants, Shrubs, Wildflowers and tagged American Beautyberry, Beautyberry, Callicarpa, Callicarpa americana, Know Your Natives, Lamiaceae. Bookmark the permalink.